Otakar ?evcík?s op. 2 is a fundamental tutor for teaching the violin. 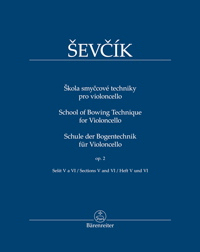 It focuses on the elementary problems of right-hand technique which ?evcík practises in 4,000 variants of systematically organized exercises for all bowings. This famous tutor has remained in use to the present day and is equally valued by players of other string instruments. The distinguished cellist Tomá? Jamník has arranged the "School of Bowing Technique" for the violoncello, taking into account its differences from the violin. He has transcribed individual exercises for the violoncello without neglecting ?evcík?s original pedagogical aims. As a result, this edition differs fundamentally from the only known cello arrangement of this opus by Louis R. Feuillard.